The Mercedes-Benz Vito panel van faces stiff competition in the medium-sized commercial van sector, but it brings a sprinkling of quality touches to argue its case against more popular rivals by offering an excellent engine and transmission line-up and a good standard of equipment. Launched in 2015, the current generation of Mercedes-Benz Vito is relatively unusual in van circles for being all-new from the skin down to the chassis, rather than an evolution of the previous version – although the two do look similar at first glance. 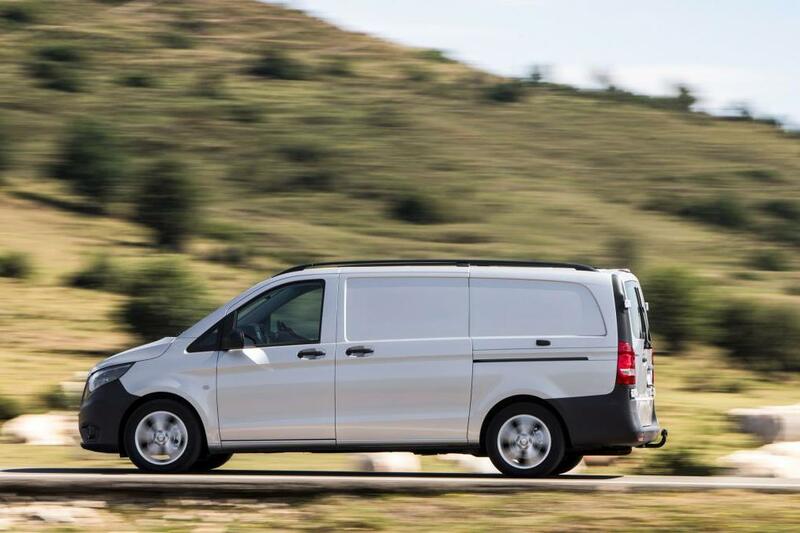 Along with the likes of the ubiquitous Ford Transit, Citroen Dispatch, Renault Trafic and Vauxhall Vivaro bruising each other's elbows and ribs in the scramble to top local monthly sales charts, the Mercedes-Benz Vito faces a stiff task to stand out against such decent competition. Competing in the medium van segment, as you'd expect from the Three-Pointed Star on the front this is one of the more premium choices on the market – which means you should expect to pay more for one of these than an equivalent model from the aforementioned competitors. As such, the Vito's closest true competitor is likely the Volkswagen Transporter, which also puts a premium on being more premium. Both hold their residual values well though, which means monthly leasing rates may prove more affordable than you perhaps would initially think. The previous generation Vito had a reputation for quality and its premium image was a tonic for residual values. However, sales of the Mercedes van were held back by its rear-drive only configuration and a lack of variety in the model range. Fortunately, that changed in 2015 with the introduction of front- OR rear-wheel drive, with two wheelbase options and in became available in three body lengths, like its bigger sibling, the Sprinter. Four-wheel drive is also available, but this is more of a special order option than a standard offering in the range. As well as the panel van versions, you can also order the Vito Crew Van and Tourer minibus models. All told, the Vito is now offered in a range that's more akin to the breadth of options offered by major competitors. The lack of a high roof variant could remain an issue for some buyers, though. Exterior visual styling upgrades included chrome sidebars and front grille trim, unique rear model badging, front fog lamps with chrome trim, rear tailgate chrome trim, colour-coded bumpers and five-spoke alloy wheels. As you would expect from a work-a-day panel van, the interior exhibits good quality utilitarian plastics. Everything is in its right place but the layout does look a tad dated. Mercedes-Benz has a hard-earned reputation for quality in the wider automotive industry, with the company's badge bringing a certain expectation when it comes to cabin quality. 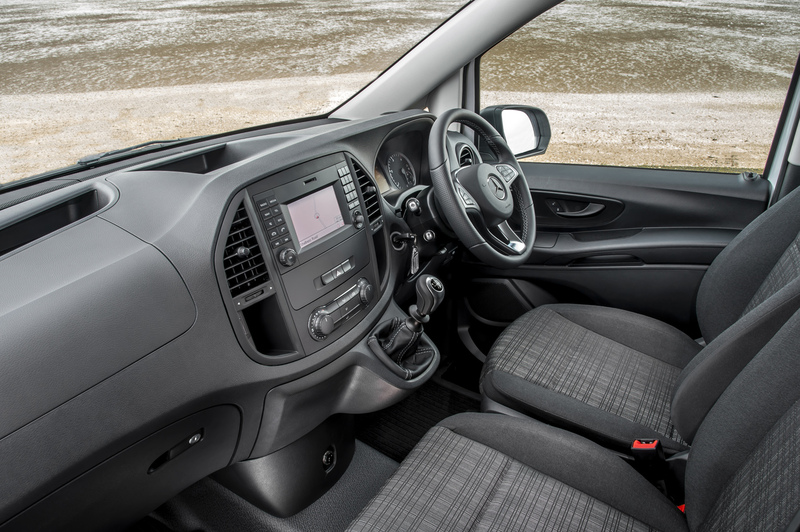 It comes as no surprise then that the Vito is right up there with the best in the class in terms of its cabin appeal. It's pleasing to the eye and has a feel solid durability with welcome touches of quality, but not a hint of soft-touch leathers and luxury fabrics. Some elements do disappoint though. For example, the 14.7cm colour TFT display at first appears to be a modern touch-screen, but in fact it's a more dated version controlled by dials and buttons. The position of the USB socket below and to the left of the screen means any charging cables will drape across the dash. Navigation in the form of a Becker MapPilot is available as a £240 option, which is reasonable and begs the question as to why it isn't standard. Storage is good rather than exceptional rather than great with just two cup holders (for three peeps), two door pockets and a relatively small glovebox. There are also three storage bays on top of the dash, but none are covered, meaning there isn't a large amount of space to tuck things out of sight. Aircraft-like overhead storage is also available. The driving position is okay for those less than six-foot tall, but those blessed with taller stature might find the driver's area a little cosy. The foot-operated parking brake is hung-over from the previous generation Vito, but goodness knows why in this day and age. It is released by a handle to the right of the steering wheel. The key fob position to the left of the steering wheel is another ergonomic oddity as the cruise control and speed limiter stalk is very much in the way. There are just two, four-cylinder turbo-diesel engines in the current Vito line-up, but thanks to a choice of five power outputs, the range is a practical one. For FWD Vito's, a 1.6-litre engine comes with either 88bhp or 114bhp (badged 109CDI and 111CDI, respectively) and is shared with the likes of the Vauxhall Vivaro and Renault Trafic. It is perfectly decent in many ways. However, torque tops out at a mere 230Nm so is best suited for lighter, urban workloads. This engine is paired only with a six-speed manual gearbox. RWD Vito's deploy Mercedes' own 2.1-litre engine which is better suited for more heavier-duty work. It provides a generous amount of low-down strength, meaning that it will be up to lugging heavy loads and towing. Three power/torque outputs are offered on this engine: 136bhp/33Nm, 163bhp/380Nm and 190bhp/440Nm (badged 114CDi, 116CDI and 119CDi respectively. Both the 114CDi and 116CDi are paired with the six-speed manual 'box as standard, but is also available with the optional 7G-Tronic automatic. However, the more powerful 119CDi is mated only to the automatic. The more astute will immediately notice the significant upgrade in performance of the 2.1-litre power plant, particularly torque, which makes them much better at shifting loads even before you've considered the additional traction offered by the rear-wheel drive layout. An all-electric version called the eVito is expected to go on sale in the UK in 2019. More details on that when we receive them. Payload for the 111CDi Long as tested is 1,145kg, with a load volume of six cubic metres. Useable load length at the floor is 2,831mm which includes the 370mm under the bulkhead. Maximum load height is 1,391mm. All Mercedes-Benz Vito vans are fitted with the following standard safety equipment: Driver and passenger airbags; Adaptive ESP which varies the braking force required to prevent a loss of grip depending on the weight and position of the van's load; Crosswind Assist which actively stabilises the van in windy conditions; Attention Assist to detect driver fatigue and of course Hill-start Assist. Optional Vito safety equipment includes: Reversing camera with trailer mode, a system that shows projected coupling lines on the screen; Parking Assist, which automatically steers the van into spaces; Collision Prevention Assist - an autonomous emergency braking (AEB) system which is becoming increasingly standard on passenger vehicles of late. Security equipment isn't quite so generous, with only remote locking and an immobiliser as standard. Mercedes does offer an alarm, but at extra cost. 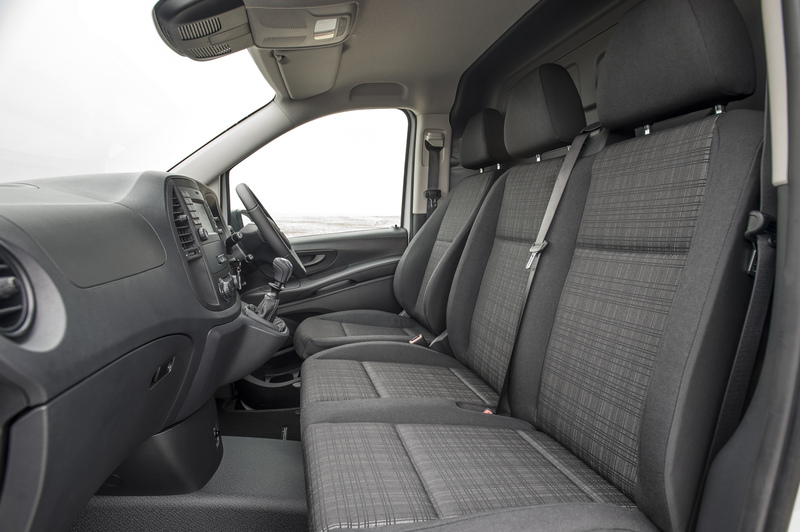 For a van, it's surprisingly comfortable and enjoyable to drive, with well-tuned suspension that provides a nice mix of supple ride quality, responsive handling and load-carrying ability. All-round vision is good with decent-sized mirrors and a reversing camera. 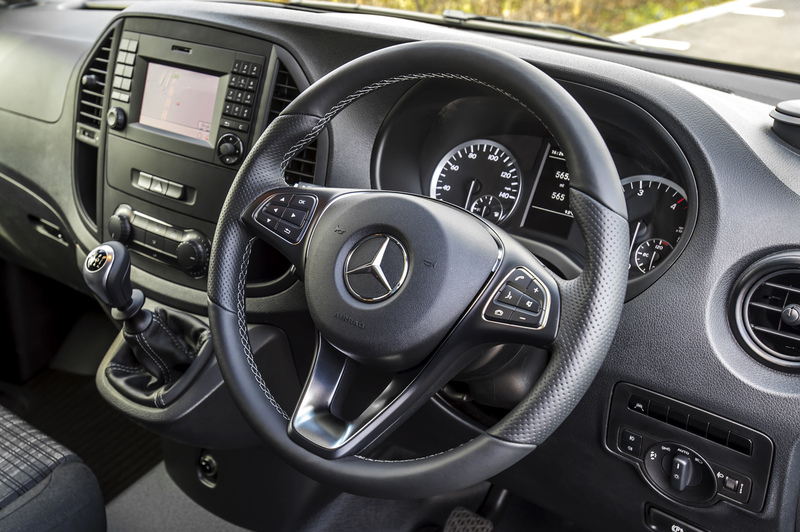 One element of the Vito that is most car-like is its steering - it lacks the heaviness of some rival systems, which makes it lighter at lower speeds and around town, while it weights up at faster speeds. In some ways, this is a good thing - it makes urban manoeuvres a bit easier, for example - but it won't be to everyone's taste. The refined 1.6-litre turbo-diesel in the test van showed willing with reasonable throttle response while the 270Nm of torque proved adequate in busy city and suburban driving. Personally, I would opt for the 2.1-litre 116CDi manual as a better all-rounder. The stalk-activated cruise control and speed limiter offers a simple, one-step engagement that also maintains the set speed on downhills. I spent a brief while in an automatic Vito recently and the 7G-Tronic is as good as you can get in a van. It's smooth and makes urban jobs much more relaxed than the six-speed manual 'box. There were flappy paddles but these were largely superfluous – and they're rather slow to respond. 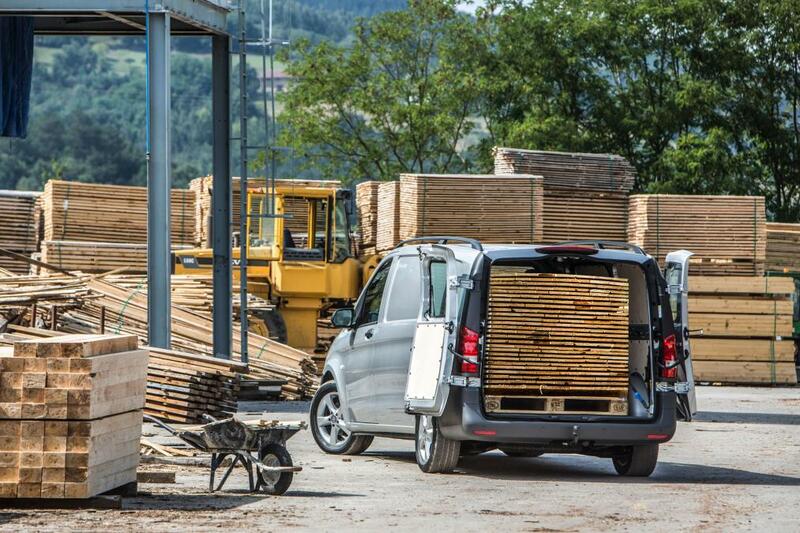 The Mercedes-Benz Vito panel van is a versatile and capable vehicle. It would easily fulfil the work-a-day requirements of a tradesman or small business owner needing to carry a good amount of cargo. But, loaded or not, the Vito exhibits impressive body control and is a very comfortable van for long motorway journeys. In the 111CDi guise as tested, the Vito goes well, carries its payload without a struggle and is safe.Although the interior isn't as flash as what you might expect there's not much to complain about. Its main Achilles' heel is its purchase price. Tick away at a few option boxes and the price escalates somewhat too quickly. As with many commercial vehicles of this ilk, the best and least expensive option to get your Vito on the road is to lease it. ➤ Check out our special offers on the current Mercedes-Benz Vito Panel Van here, then call our award-winning Customer Service Team on 0800 043 2050.